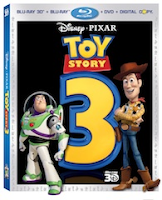 Toy Story 1, 2 and 3 Coming to Blu-Ray 3D! Consumers are invited to experience Disney•Pixar's “Toy Story,” “Toy Story 2” and “Toy Story 3” in an all-new way! All three groundbreaking films will be unveiled in stunning Blu-ray 3D for the home, allowing fans to go back inside the toy box and enjoy their favorite characters in a whole new dimension. 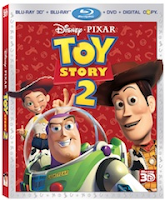 While Andy is away at cowboy camp, Woody is toynapped by Al McWhiggin, a greedy collector who needs Andy's favorite toy to complete his “Woody’s Roundup” collection. Together with Jessie, Bullseye and the Prospector, Woody is on his way to amuseum where he'll spend the rest of his life behind glass. It's up to Buzz, Mr. 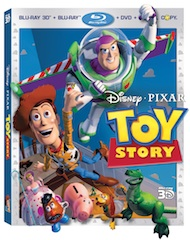 Potato Head, Hamm, Rex and Slinky Dog to rescue their friend and remind him what being a toy is all about.